Want to have a leg up on everybody's costumes this coming Halloween? 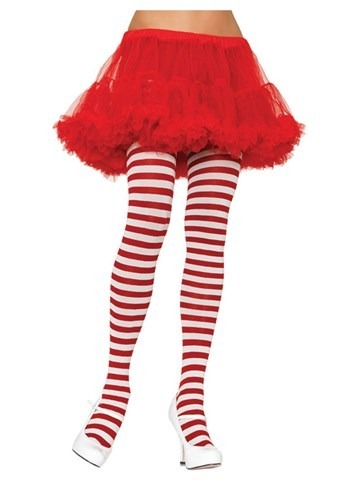 Well, then step your leg game up with this White/Red Striped Tights! Be the Waldo that everyone is willing to search for till the ends of the earth. You could look like the sassiest elf in Santa's workshop or the cutest clown dancing around the party when you slip your legs into this playful pair of pantyhose. No matter what outfit you add these striped tights too, you'll look as animated as the zany characters of Dr. Seuss's world and as tasty as a candy cane. Planning to wear a fun tutu or devilish skirt, along with a sensual pair of high heels or go-go boots this year? Well, once you add these tights to your getup, you'll be one step closer to having the best legs strutting around town this Halloween! With millions of options to dress up as this coming holiday, just make sure you chose one that you can pair these titillating tights too and you'll be the talk of the party.